Figure 1. 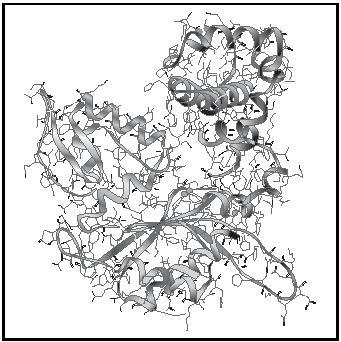 The 3-dimensional molecular structure of the globular protein polymerase β . The ribbon represents the backbone of the amino acid chain with the various amino acids depicted by shading. The side chains of the amino acids fill in the structure. nonpolar side chains "point" inward and interact with one another and polar side chains are oriented outward such that they are exposed to adjacent polar water molecules. Over the last few decades, molecular shape and structure have been experimentally determined for several thousand proteins. The aqueous solubility of globular proteins allows them to exist in biological fluids as individual molecules or in small clusters and to accomplish a wide range of critical biological functions, for example, the enzymatic catalysis of chemical reactions. Globular proteins also function as anti-bodies in the body's immune system and as transport vehicles for other molecules in circulating blood, and they are heavily involved in the replication and repair of DNA . Figure 1 shows the molecular structure of polymerase β , a much-studied globular protein that catalyzes reactions having to do with the repair of damaged DNA. The structure of polymerase β was determined by Huguette Pelletier and her coworkers using the technique of x-ray diffraction at the University of California, San Diego. SEE ALSO Amino Acid ; Proteins ; Tertiary Structure . Blei, Ira, and Odian, George (2000). General, Organic, and Biochemistry: Connecting Chemistry to Your Life. New York: W. H. Freeman, 2000. Cantor, C. R., and Schwimmel, P. R. (1980). Biophysical Chemistry I. The Conformation of Biological Macromolecules. New York: W. H. Freeman. Pelletier, Huguette; Sawaya, Michael R.; Kumar, Amalendra; Wilson, Samuel H.; and Kraut, Joseph (1994). "Structures of Ternary Complexes of Rat DNA Polymerase Beta, a DNA Template Primer and ddCTP." Science 264:1891.